Stay the night in our modern equipt rooms. 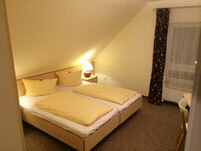 Each room has his own bathroom with shower, FlatTV, free WIFI and many other fine details for a comfortable vacation. 8 am to 11 am. You have to start earlier? No Problem. 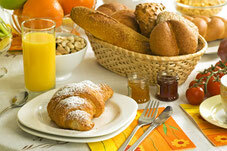 Tell us your breakfast time and we will arrange it. Stay in our fair priced guest houses. These rooms are 800-1500m away from the Hotel. They all have own bathrooms with shower, TV. Breakfast, lunch or dinner will be served at the Hotel.